A Chinese icebreaker is fast approaching a Russian ship which has been trapped in the Antarctic ice. The vessel is carrying 74 people on board. The Icebreaker is expected to reach the stricken ship tomorrow.The Chinese Ice Breaker name Snow Dragon is one of the three ice breakers which has been sent to free the Russian Vessel. 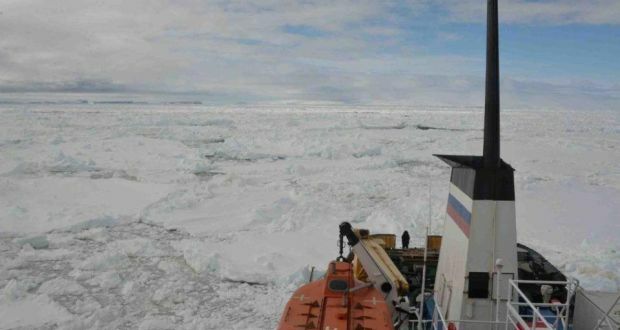 The Russian Vessel named MV Akademik Shokalskiy has been stuck in thick ice far south of Tasmanis from Tuesday in ice which is being driven by gale level winds. The Russian Foreign Ministry is keeping a close watch on the situation and it said that the Chinese Ice breaker will be the first vessel which will reach the stricken ship on December 28th. Chris Turner, who was one of the organizers of the voyage on the Russian ship and a professor, had tweeted, “Great news: Icebreaker Snow Dragon on Horizon with penguins! Everyone very happy!” Chris had also posted a picture displaying the Chinese Vessel as a tiny speck on the faraway horizon surrounded by endless multitude of ice sheets. The Russian ship Akademik Shokalskiy was hired for the privately funded expedition which was to commemorate the Antarctic journey led by famed Australian explorer Douglas Mawson a century ago. Among the passengers were scientists and tourists and many of the passengers were Australian citizens. The ship was also carrying 22 Russian crew members. The Russian Embassy has in a statement said that it is closely monitoring the situation and is in constant contact with the captain of the ship. All the passengers are in excellent health and there is no threat to their lives safety. The Russian ship is stick in thick ice some 185 km east of French Antarctic station Dumont D’Urville and about 2,800 km nautical miles south of Hobart, Tasmania. The rescue efforts are being coordinated by the Australian Maritime Safety Authority. It said in a statement early today that three vessels have been dispatched to rescue and it is making slowly towards the the Akademik Shokals at a distance of 15 nautical miles.